Stiff link carp rigs tend to be more effective when used on hard, clear lake beds. They are not very effective when used in deep silt or heavy weed areas. The loose debris scattered around weedy/silt areas can cause the stiff links to become caught up and tangle. In other situations, even if the rig misses all the debris, a fish could pick it up or it moves it about with their close movements, and again causes it to be caught up or tangles slightly. As a tip, always tie loops at swivels so the rig has complete flexibility to allow the hook enough movement to go into a carp’s mouth. Combi-links are used in order to give benefits from both stiff, and supple materials. The stiff section reduces tangles and helps push the hook away from the lead as it settles. The supple end provides the flexibility so the hook can extend easily into a carp's mouth. It also means the rig can work effectively no matter which side a fish approaches the bait. You can easily make a combi-link fishing rig from materials such as snake bite or snake skin. By stripping back a section of the material by the hook you create a supple piece which acts the same as if creating a rig from two separate materials. I like to use combi-rigs for a large part of my fishing. I find they can be a great rig for fishing singles or if casting a rig out with boilies attached using PVA stringers. It’s not often anglers will use extra long hook links when fishing for carp, but there are some situations where this type of tactic can work very well. You first need to balance the bait so finely that it sinks ultra slowly under the weight of the hook alone. Once you have this, you can make the hooklink up to 3 feet long! 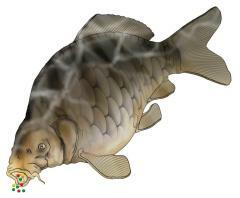 It can be used in the winter when carp don’t move much looking for food. Once you locate the fish, you cast the slow-sinking carp rig in front of the fish, the bait sinks so slowly that carp have no way of NOT seeing the bait, it also gives them plenty of time to be tempted by it. It is also best to use the slow sinking carp rig in very calm conditions as there won’t be any strong underwater current to waft it all over the place, and maybe tangle it up before a fish takes the bait. Helicopter rig systems are one of the best ways to eliminate potential tangles when casting. These can also be used for fishing on soft silt. Although, from my experience these types of rig systems cause me to lose more fish. I also feel that helicopter rigs should not be used when in, or close to snags areas.